Last week I tried Mateus for the first time, and today it's time for Lancer's! From the same days as the Mateuas, the Lancer's originated in the 1940's. I'm not exactly sure what grapes go into it -- the tech sheet simply says "A variety of the best Portuguese grapes." I got a chuckle out of that, but for $7.99 I can understand a lack of specificity (as the grapes may change based on price and availability). This is an interesting wine. It goes through a secondary fermentation giving it a bit of effervescence, and then dosage to achieve the appropriate level of sweetness. Review: This rosé is bright pink with a touch of pin-prick sized bubbles. The nose shows simple notes of confected cherries. The palate is a touch sweet with a moderate level of acidity. The cherry note continues, very simply and straightforward. For me, this is heads and shoulders above the Mateus. It's a bit less sweet, as well as less bitter. Very easy and fresh, with a short finish. Food Pairing: Friends on the patio. Bottom Line: A good substitute for water on a hot day. GRAPES: "A variety of the best Portuguese grapes"
Ready for a little Throw Back Thursday? Well, Mateus is the quintessential throwback. The wine was first launched in the 1940's, but didn't find it's heyday until the 1970's. Made from a variety of native Portuguese grapes, including Baga, Rufete, Tinta Barroca, and Touriga Franca, this sweet rosé comes in about $8. I'd seen seen the iconic flask shaped bottle over the years, but being a baby of the 80's I've never actually tasted it -- until tonight! 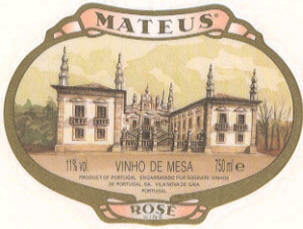 Review: The Mateus is a vivid pink color with a slight effervescence. It has aromas of ripe berries and watermelon. The palate is a bit on the sweet side (15 g/L residual sugar), with a strong flavor of strawberry jam. The finish is short and quite one note. This is a wine I can see someone enjoying ice cold on a hot day. Simple and refreshing. But do make sure to serve it super chilled -- as it warms, a slight bitterness emerges that makes for less fun sipping. Food Pairing: Ice cubes on your front porch. Bottom Line: A simple wine.